It’s a super day for Superstore! NBC just announced they’ve renewed the TV show for a fifth season. It’s not that surprising NBC has renewed Superstore. The show’s ratings have been consistently good for nearly four seasons now, with the current season averaging a .86 rating in the 18-49 demo and 3.168 million viewers. NBC has renewed its critically applauded comedy “Superstore” for a fifth season. 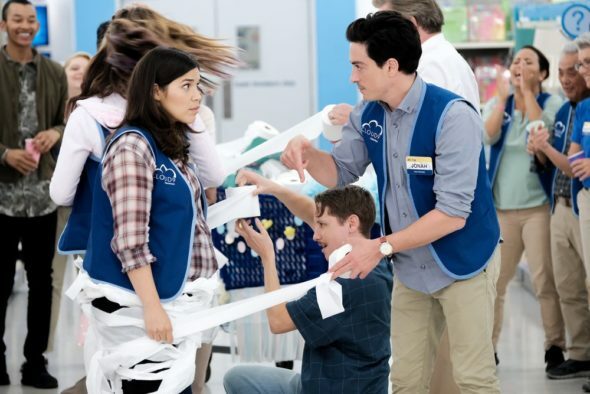 Season to date “Superstore” is averaging a 1.4 rating in adults 18-49 and 4.4 million viewers overall in “live plus seven day” Nielsens in the highly competitive Thursday 8-8:30 p.m. timeslot versus such rival programming as “The Big Bang Theory,” “Grey’s Anatomy” and NFL “Thursday Night Football.” Delayed viewing boosts “Superstore’s” next-day 0.85 rating in adults 18-49 by +154% to a 2.16 after seven days of linear and digital viewership. “Week after week Justin Spitzer, our amazing writers, and cast and crew masterfully deliver a comedy that not only makes us laugh but speaks to the larger issues of the day,” said Lisa Katz and Tracey Pakosta, Co-Presidents of Scripted Programming, NBC Entertainment. “Superstore” returns to the NBC lineup this Thursday, March 7 at 8 p.m. ET/PT. Superstore” was created by Justin Spitzer, who serves as an executive producer with director Ruben Fleischer, David Bernad, Gabe Miller & Jonathan Green and Jackie Clarke. What do you think? Do you watch Superstore? Are you glad it’s coming back?